At a time when “endurance running” no longer means mere marathons — and even 100-mile races are attracting the masses — Karl Meltzer, a former ski-resort bartender, has proved he can suffer longer and faster than almost anyone else. 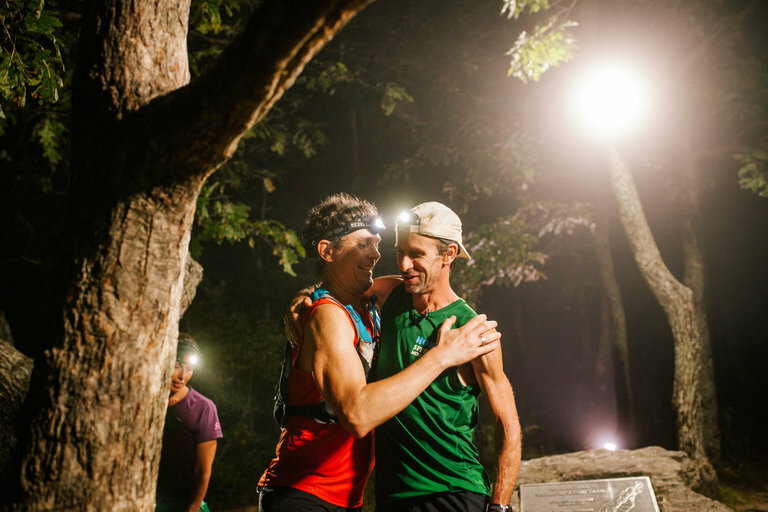 When he staggered onto Springer Mountain in Georgia before dawn Sunday, Meltzer set a record for completing the Appalachian Trail. He covered the 2,190 miles over 14 states in 45 days 22 hours 38 minutes. Meltzer, 48, is a little different from other titans of the newly booming ultra-running scene. He is six years older than Scott Jurek, who was featured in the best-selling book about almost-barefoot endurance running, “Born to Run” — and who set the former Appalachian Trail record last year (46 days 8 hours 7 minutes). In a sport checkered with mantras like “clean living,” Jurek sustained his trek on a vegan diet. Staples of Meltzer’s diet, by contrast, included Red Bull and Tang. Jurek incurred a $500 fine and public outrage for opening champagne at the summit of Mount Katahdin in Maine during his record run. When Meltzer finished Sunday, he walked down the mountain, sat in a chair and sated himself with pepperoni pizza and a beer.